This article is about Captain Falcon's appearance in Super Smash Bros. 4. For the character in other contexts, see Captain Falcon. Captain Falcon (キャプテン・ファルコン, Captain Falcon) returns as a playable character in Super Smash Bros. 4. He was confirmed during a live stream on July 14th, 2014, which is exactly 16 years after F-Zero X was released for the Nintendo 64 in Japan in 1998, alongside Lucina and Robin. 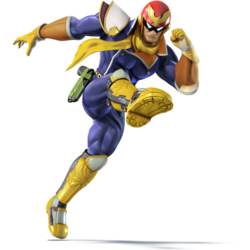 Captain Falcon is once again voiced by Ryō Horikawa, using recycled voice clips from Brawl. Captain Falcon currently ranks 19th on the SSB4 tier list, placing him in the B tier. This is a remarkable improvement over his bottom tier placement in Brawl, where he was ranked 34th out of 38. Thanks to the changes to hitstun canceling, Captain Falcon's lost combo game has been greatly restored. Additionally, Captain Falcon retains his rudimentary speed and power, allowing him to rush foes down with ease. When combined with his excellent endurance, Captain Falcon has a very effective neutral game, courtesy of his strong edgeguarding game, further supplemented by several renowned moves, the most notable being his forward aerial. However, Captain Falcon has noteworthy shortcomings. Captain Falcon remains highly susceptible to combos, which are linked to his high weight, gravity, falling speed, and hurtbox. While his high air speed and air acceleration can allow him to return to a stage, Raptor Boost and Falcon Dive do not grant sufficient protection, meaning that Captain Falcon is also very vulnerable to edgeguarding himself. Captain Falcon's neutral game is also moderately hindered by his short range and lack of a projectile, making it very difficult for him to counter spacing and camping. Captain Falcon is a tall, heavyweight character. However, his attributes are nearly unconventional of his weight class; he has the second fastest dashing speed, the fourth fastest falling speed, and the twelfth fastest air speed. Strangely, though, his walking speed is rather slow. Such an odd mix of traits grant him excellent mobility, yet also allow him to keep up with his opponents. Despite lacking a projectile, Falcon has an overall effective neutral game, thanks to his mobility. His dash grab covers a long distance, making it a reliable approach option, and his back aerial is quick, has good range, and autocancels in a short-hop, allowing it to lead into his grab. From there, he has many tools with which to rack up damage. His pummel is quick, and his down and forward throws are effective combo-starters, with his combo ability being arguably his greatest strength. His down throw leads into multiple up aerials, or his neutral aerial, and his forward throw combos into his dash attack or even his neutral air at low percents. Falcon's up aerial demonstrates the versatility of his combo game. At a wide range of percents, it can chain into any aerial including itself. Starting at mid-percents, it can even lead into his down air meteor smash on grounded foes, which can either extend combos onstage, or finish opponents near the ledge. Alternatively, Falcon can chain his up aerial into some his deadliest finishers, which include his down air meteor smash and the famed Knee Smash forward air, and end his opponent's stock below 100%. Captain Falcon also boasts excellent KO power, as well as a formidable edgeguarding ability. His smash attacks and back aerial deal high knockback, and his aforementioned Knee Smash is an extremely powerful semi-spike that KOs at early percents offstage. His down aerial is relatively fast, has a large hitbox, and its sweetspot is one of the most powerful meteor smashes in the game, while its sourspot deals high horizontal knockback. His down tilt is a semi-spike, being useful for putting opponents offstage. His back and forward throws are good for starting edgeguards, and KOing at high percentages. Due to his heavy weight, he is a proficient user of rage, boosting his already strong KO power. However, he has his weaknesses. Though he has numerous hard-hitting moves, most of them are difficult or slow to land, some prominent examples being his smash attacks. His Knee Smash is faster than those moves, but it suffers from a small sweetspot that lasts for only one frame, making it hard to land without an air dodge read or setup off of an up aerial. As a result, he often has to rely on edgeguarding to score his kills. Though his neutral game is good overall, his lack of a projectile leaves him susceptible to camping, especially against characters like Villager. Falcon suffers from a poor out of shield game and, while his dash grab has a long range, his standing grab range is average at best. His dash grab is also very easy for players to whiff should they use it carelessly, especially since Captain Falcon's overall high mobility may make him a bit difficult to control properly. His high weight and fast falling speed give him endurance, but they also leave him especially vulnerable to combos, and he has no fast options with which to break them. Captain Falcon's greatest problem lies in his recovery, despite having an impressive air speed. His two recovery options, Falcon Dive and Raptor Boost, are linear and do not grant enough distance, making them predictable and easily intercepted, and they have small ledge sweetspots. These two moves do not have hitboxes above him, leaving him open to meteor smashes, which he usually cannot survive due to his short recovery and falling speed. To his merit, he can reuse Falcon Dive if it connects with an opponent, and even stage spike them, though this is easily teched. Although he has a wall jump, he will be in danger offstage without his double jump. With customs on, Captain Falcon gets many benefits. While Falcon Dash Punch is weaker and has slower startup than the default Falcon Punch, it propels himself forward, forcing his opponents offstage for him to KO them with his aforementioned above average edgeguarding tools. Heavy Raptor Boost, while being slower and giving less distance, has super armor throughout and much more power. Wind-Up Raptor Boost, while being weaker than the regular Raptor Boost, allows for mindgames as Captain Falcon backs up a bit before charging forward, and it moves faster as well. Falcon Strike, while being unable to grab opponents, thus sacrificing reusability, has a hitbox during the entire ascent, granting better overall protection. It also goes higher and has much more horizontal momentum, not only giving Captain Falcon a better vertical recovery, it also gives him one of the quickest horizontal recoveries in the game, as his already fast air speed is put into even better use. The Explosive Falcon Dive is similar to the Heavy Raptor Boost in that while it is slower and has less recovery potential than the default, has much more launching power KOing at 80% in the air. Finally, even though Lightning Falcon Kick has slower startup and weaker knockback than Falcon Kick, it travels significantly faster and the landing hit paralyzes opponents, which allows numerous setups should the Captain Falcon player be skilled and lucky enough to pull it off. It also goes straight through opponents, allowing for easy cross-ups. Overall, Captain Falcon's strengths outweigh his weaknesses. With speed, power, and easy-to-use combos off of throw setups, he has a comparatively low learning curve and high payoff. While Falcon is not as common or as dominant as other perceived top-tier characters such as Bayonetta and Rosalina & Luma, he has a dedicated playerbase that brings his usage in line with many characters said to be better than he is, with many top players continuing to use him as a main or a secondary. As a result, he has achieved notable tournament success at high-level play and even stronger results in low- and mid-level play (including regional tournaments), and is considered by the competitive community to be a viable choice for tournament play. Captain Falcon has been significantly buffed from Brawl, in which he was a low-tier character despite his speed and power. Several of his moves have been given more reach and knockback, and some of his situational moves, such as his up tilt, have been greatly improved. Falcon's grab game has also been buffed, as his throws have less ending lag, allowing him to string together combos more reliably, much as he could before Brawl. Complementing this is his newly buffed dash grab, which comes out very quickly and covers a lot of distance. Falcon also significantly benefits from the changes to two of Brawl's mechanics - hitstun canceling, which is now only possible at higher percents and restored his comboing ability for lower percents, and chain grabbing, which is now impossible and was one of his biggest weaknesses in Brawl. As he is a heavyweight character, Falcon also benefits from the rage mechanic, without his combos being affected. As in SSB and Melee, Falcon is mainly a heavily offensive rushdown character who relies on overwhelming his opponents with rapid combos and powerful finishers. On the other hand, some of Captain Falcon's previous staple moves were nerfed; for example, his Knee Smash now has much more landing lag and can no longer autocancel from a short hop, and Falcon Dive has decreased safety due to its higher ending lag, weakening some of his possible recovery mixups. As a result, while being considered noticeably better than in Brawl he is often still considered to be slightly inferior to his Melee incarnation. However, these nerfs are very minuscule compared to the massive buffs he received, and Captain Falcon is one of the few characters to get truly buffed in his transition from Brawl to SSB4. Captain Falcon now has a brighter color scheme overall in SSB4, which matches his appearance in the F-Zero series. His racing suit and boots are now tighter, which make his model more well-defined and muscular than in Brawl. His face also has more-visible dimples. He has also lost the hair from the back of his head. Captain Falcon's green alternate costume has been updated. His helmet and suit are now jungle green, instead of chartreuse green and goldenrod, respectively. Additionally, the falcon on Captain Falcon's helmet is now gold, instead of beige. Lastly, his scarf is now red, instead of pink. Captain Falcon has also received two new alternate costumes. All of Captain Falcon's actions involving fire have more fiery visuals. Like other characters, Falcon has more exaggerated facial expressions (albeit less noticeable due to his helmet), and clenches his teeth when performing certain attacks and during one of his victory poses. Oddly enough, however, Captain Falcon's mouth no longer moves for his voiced down and side taunts (instead grimacing with a closed mouth for his down taunt), despite his mouth being fully animated for a few of his moves and victory poses. His mouth can still be seen moving in certain circumstances, such as during the slowdown after ending a match, which may be carryover from Brawl. Captain Falcon walks faster (0.85 → 0.94). Captain Falcon dashes faster (2.18 → 2.32). Captain Falcon's initial dash is slower (2.05 → 1.7). Captain Falcon's gravity is higher (0.1027 → 0.12), slightly worsening his endurance and making his jumps lower, although this is slightly mitigated by his short hops being faster. Captain Falcon's air speed is slower (1.18 → 1.1). Captain Falcon's air acceleration is faster (0.05 (additional) → 0.065). Captain Falcon arguably benefits the most from the changes to hitstun cancelling, as it restores his ability to perform combos, especially with and into some of his more powerful moves. The removal of chain grabbing improves Captain Falcon's survivability, as he is no longer vulnerable to them. Rolls have less end lag (frame 32 → 28). Rolls have a shorter duration (frames 4-19 → 4-15). Sidestep has more startup lag, a shorter duration (frames 2-20 → 3-18) and more ending lag (frame 26 → 28). Neutral attack's second hit can now either transition into the Gentleman alone, or skip to the neutral infinite if the attack button is pressed repeatedly, instead of performing both in succession. This makes the move much more versatile, allowing it to either quickly launch targets away with the Gentleman, or rack up damage more reliably with the infinite. Gentleman also launches at a lower angle (70° → 361°) and has drastically more knockback akin to the Melee version (10/0 (base)/50/70 (scaling) → 70/100), making it safer on hit and allowing it to KO near edges. All hits of neutral attack except the second hit deal less damage (3% → 2% (hit 1), 6% (clean)/5% (late) → 5% (Gentleman), 2% (near)/1% (far) → 1% (infinite)). The first hit also has more ending lag (frame 16 → 18), worsening its jab canceling ability. Lastly, Gentleman has slightly smaller hitboxes (6.2u → 6u), and its duration is shorter (frames 6-9 → 6-8) due to the late hit being removed. Gentleman has a higher hitlag multiplier (1× → 1.2×). This makes it safer on shield, but easier to DI. Neutral infinite has different angles (361°/90° → 85°/75°/90°), slightly higher knockback (0 (base)/50/20 (scaling) → 15/8 (base)/50/30 (scaling)), and deals no hitlag due to its much lower multiplier (1× → 0.3×), making it impossible to SDI. One of its hitboxes is also larger (4u → 4.2u) and positioned directly in front of Captain Falcon for every hit, regardless of the punches' different angles. Altogether, these changes allow it to connect much more reliably. Lastly, neutral infinite has received a finisher, a short straight-punch. Forward tilt has less ending lag when not angled (frame 37 → 32) and angled downward (frame 32 → 31), and deals consistent base knockback when angled downward (0/10 → 10). Forward tilt deals less damage when not angled (10%/9% → 9%/8%) and angled upward (11%/10% → 10%/9%). Up tilt now meteor smashes aerial opponents if the heel is landed (361° → 275°), greatly improving its KOing and edgeguarding potential. The non-meteor smash hitboxes on the other hand launch at a higher angle (361° → 60°), which coupled with the changes to hitstun canceling grants them some combo ability from low to mid percents. Up tilt deals less damage (13% → 11%), with knockback not fully compensated on the non-meteor hitboxes (50 (base)/80 (scaling) → 35/22 (base, non-meteor/meteor)/100 (scaling)), hindering their KO potential. It also has a shorter duration (frames 17-22 → 17-20), and the heel hitboxes are smaller (6.5u → 6u (non-meteor)/3.5u (meteor)). Down tilt now always sends opponents at a semi-spike trajectory (80°/40°/20° → 25°), and has increased knockback (25 (base)/75 (scaling) → 38/80), allowing it to edgeguard and set up tech-chases more effectively. It also has less ending lag (frame 37 → 35). Due to its altered angle, down tilt has lost all of its combo potential outside of tech-chasing. Its also has a shorter duration (frames 11-15 → 11-12). Dash attack has larger hitboxes (6u (clean)/4.5u (late) → 6.2u/4.8u), higher knockback (80/65 (base, clean/late)/40 (scaling) → 90/50), and its clean hit deals more damage (8% → 10%), while its late hit launches at a higher angle (40° → 65°). This improves its approach potential, and coupled with the changes to hitstun canceling, its combo potential. Forward smash has increased startup (frame 18 → 19). Forward smash has increased knockback (20 (base)/85 (scaling) → 24 (base)/95/83 (scaling)), and deals more damage (18% → 20%) with a lower launch trajectory (40° → 38°) when angled downward, improving its KO potential. It also has a longer duration (frames 18-20 → 19-22). Captain Falcon can no longer do a two-hit forward smash with battering items, nor can he fire multiple stars at once with the Star Rod. Up smash's first hit has different angles (90°/100° → 95°/110°) and higher set knockback (80/100 → 120/140) on its lower leg hitboxes, and its upper leg hitboxes have gained set knockback (0 → 20). This allows it to connect more reliably into the second hit, which has slightly increased knockback scaling (102/103/110 → 104/106/112) and larger hitboxes (4.8u → 6u/5.5u/5u). The changes to hitstun canceling also grant the move combo potential against fast-fallers at low to mid percents. Up smash's first hit deals less damage on its lower leg hitboxes (8% → 6%), and one of them is smaller (6.72u → 6u). Both hits also have a shorter duration (frames 22-23 (hit 1)/28-29 (hit 2) → 22/28). Down smash's front hit no longer has a hitbox that deals 6% with set knockback, making it more reliable. The back hit also deals more damage (16% → 18%), improving its KO potential. Down smash's front hit deals less damage (16% → 14%) with its knockback scaling not fully compensated (85 → 90), hindering its KO potential. Both it and the back hit also have smaller hitboxes (6u/5u/4.5u/4u → 4.5u/4.2u/3.7u). Down smash's front hit no longer has indirect hitboxes. The back hit has a higher hitlag multiplier (1× → 1.2×), making it safer on shield, but easier to DI. Neutral aerial has increased knockback scaling (125 → 130), improving its edgeguarding potential. The changes to hitstun canceling also grant it much better combo potential at low to mid percents, especially into itself. Neutral aerial has more landing lag (9 → 12 frames). Knee Smash is much easier to combo into at mid percents due to up aerial's new angle and the changes to hitstun canceling. The increased shieldstun, 19% damage increase on shields and changes to shield hitlag improve Knee Smash, back aerial and up aerial's shield pressuring potentials, with the latter two now being safe on shield with properly timed landings. Knee Smash has increased ending (frame 40 → 46) and landing lag (22 → 30 frames), and autocancels later (frame 35 → 42), no longer doing so in a short hop. Its late hit also has a lower trip chance (30% → 20%). Back aerial has consistent base knockback (20/0 → 25). Clean back aerial deals less damage (14% → 13%). Clean up aerial launches at a higher angle (361° → 70°), making it much more effective for combos. Up aerial deals less damage (13%/12% → 11%/10% (clean), 12%/10% → 10%/9% (late)), hindering its KO potential despite its base knockback being slightly increased (10 (clean)/8 (late) → 16/10). It also autocancels later (frame 22 → 24), and due to the clean hit's higher angle, it can only edgeguard effectively with the late hit. Down aerial's meteor hitbox is noticeably larger (4.5u → 5.9u). Coupled with the removal of meteor canceling, this drastically improves its edgeguarding potential. Due to Captain Falcon's higher gravity, down aerial can no longer autocancel in a short hop. Dash grab covers significantly more ground, making it much easier for Captain Falcon to grab opponents. It also comes out faster (frame 11 → 9). Pivot grab comes out faster (frame 16 → 12), no longer being the slowest non-tether pivot grab in the game. Forward and down throws have less ending lag. Coupled with the changes to hitstun canceling, this allows the former to start combos from low to mid percents, and the latter to start combos even up to high percents, despite its knockback being increased (75 (base)/34 (scaling) → 80/45). Forward throw has significantly increased knockback (45 (base)/105 (scaling) → 55/120), improving its KO potential. Back throw has significantly increased base knockback (30 → 60), improving its KO potential near edges and allowing it to set up edgeguards more effectively. Up throw deals more knockback (70 (base)/105 (scaling) → 80/110), allowing it to KO floaty or lightweight characters on stages with platforms or low ceilings. Down throw deals less damage (7% → 6%). Floor attacks deal more shield damage per hit (1 → 8). Front floor attack also deals more damage per hit (6% → 7%), with minimally compensated knockback scaling (50 → 48). Front floor attack's angle has been altered (361° → 48°). Back floor attack has lower knockback scaling (50 → 48). Edge attack no longer has set knockback (110 (set)/100 (scaling) → 90 (base)/20 (scaling)). Edge attack deals less damage (10% → 7%). Falcon Punch can no longer be SDIed (1× → 0×). It also has a higher hitlag multiplier (1x → 1.5x), which alongside the increased shieldstun and 19% damage increase to shields improves its shield pressuring ability. Falcon Punch has significantly decreased knockback (30 (base)/93 (scaling) → 0/90), making it weaker than his fully charged forward smash unless reversed on the ground. It also has more ending lag (frame 100 (non-reversed)/108 (reversed) → 110/118), which combined with the removed base knockback makes it unsafe on hit at low percents. Lastly, it has smaller hitboxes (5u/3.5u → 4u/2.5u). Falcon Punch deals consistent damage for all its versions. This overall increases the reversed versions' damage (28%/26%/24% → 28% (grounded), 27%/24%/23% → 25% (aerial)), and averages the non-reversed grounded version's damage (27%/25%/23% → 25%), but overall decreases the non-reversed aerial version's damage (26%/23%/22% → 22%). Raptor Boost deals more damage (7% → 9% (grounded)/8% (aerial)). Grounded Raptor Boost also deals more shield damage (2 → 4), launches at a higher angle (80° → 85°), and has increased knockback scaling (52 → 75), significantly improving its KO potential especially with rage. Lastly, it no longer dashes off edges, making it harder to self-destruct with. Grounded Raptor Boost's attack has a smaller hitbox (8u → 7u) and more ending lag (frame 26 → 36). Aerial Raptor Boost is also no longer a guaranteed meteor smash on aerial opponents (270° → 60°/275°), making it much harder to edgeguard with. Furthermore, both versions have a higher hitlag multiplier (1× → 2×), making them easier to DI, while still being unsafe on shield due to the grounded version's higher ending lag and the aerial version's landing lag. Falcon Dive covers more distance while losing less momentum, improving Captain Falcon's recovery. The removal of grab armor removes the minimal protection Falcon Dive provided, leaving Captain Falcon more vulnerable to edgeguarding. Falcon Dive's angle has been altered (361° → 50°). It has a modified animation after the attack's explosion, where Captain Falcon does a flourishing backflip before righting himself. Grounded Falcon Kick has more startup (frame 15 → 18) and ending lag (frame 70 → 74). Aerial Falcon Kick's clean hit also has lower knockback scaling (70 → 60), hindering its KO potential. Grounded Falcon Kick's clean hit deals drastically more knockback (50 (base)/70 (scaling) → 60/80) and launches at a higher angle (45° → 80°), while its mid and late hits have more base knockback (62 (mid)/50 (late) → 90/80), improving its KO potential. Its late hit also lasts longer (frames 26-33 → 29-38). Lastly, aerial Falcon Kick's late hit has higher knockback scaling (60 → 65). Grounded Falcon Kick's mid hit's angle has been altered (85° → 68°). Blue Falcon has larger hitboxes upon startup. Captain Falcon has been slightly nerfed in most balance patches so far, mostly to his KO power. However, changes to the shield mechanics in 1.1.0 and 1.1.1 have indirectly buffed Falcon, as the increase in shieldstun and the application of hitlag on shields benefit many of his moves, improving his offensive playstyle. Some hitbox data has been adjusted. Down-angled forward smash's knockback has been noticeably reduced hindering its KO potential . Neutral infinite has less visual whiffs. Non-angled and up-angled forward smash's knockback scalings have been minimally increased, now KOing about 1-2% sooner. Down-angled forward smash also launches at a lower angle. Down-angled forward smash's knockback scaling has been minimally decreased, KOing about 1-2% later. Up aerial deals less damage, making it weaker for KOing despite its base knockback being slightly increased. Up aerial's reduced knockback allows it to combo up to higher percents. Back aerial deals less damage: 14% → 13%. Neutral infinite finisher's horizontal displacement has been reduced: 14u/19u → 10u/15u. Wind-Up Raptor Boost deals more damage: 8% ground/7% air → 9%/8%. Blue Falcon's visual effects modified. Captain Falcon can wall jump. 2% Two straight punches followed by a knee strike. Alternatively, the first two punches can be followed by a series of punches, culminating in an underhand punch that has very high base knockback. The infinite and underhand punch have deceptively high range. 10% (foot), 9% (leg) A roundhouse kick. Can be angled, which increases its damage. Useful for spacing and locking. 11% An axe kick with good horizontal knockback. Can be used to continue or start combos at mid percents. It is a powerful meteor smash on aerial opponents if the heel is landed, colloquially referred to as the "Heel of Shame". However, it has very slow startup for a tilt. 10% A sweep kick with horizontal knockback. Great for edgeguarding due to its trajectory, but has noticeable startup. 10% (clean), 6% (late) A shoulder tackle. Useful for punishing landings due to its distance covered, and can be used to set up an aerial attack. 20% Rears back and performs a lunging elbow strike with a flame effect. It has deceptively long horizontal range due to Captain Falcon leaning forward, and boasts enough knockback to KO middleweights between 90% and 100% from the center of Final Destination. However, it has slow startup and high ending lag. 11%/6% (hit 1), 13%/12% (hit 2) Performs a spinning double hop-kick. A potent move that despite its slow startup, has low ending lag and deceptive horizontal range. Both hits deal more damage at the upper portion of Captain Falcon's leg. At low to mid percents, it can combo into an up aerial against fast-fallers. 14% (hit 1), 18% (hit 2) Kicks forwards and then backwards. The back kick is more powerful, KOing middleweights under 110% from center stage. 4% (hit 1), 6% (hit 2) Kicks forwards twice. A decent follow-up option after a down throw. Can combo into itself or an up aerial, as well as a neutral attack or grab by connecting only the first hit and quickly landing with the move. Knee Smash 19% (clean sweetspot), 6% (clean sourspot), 3% (late) A knee strike. It has very high knockback and an electric effect if sweetspotted, but is incredibly weak if sourspotted. Reliably KOs below 90% from center stage and even earlier near the edge, and is the strongest forward aerial in the game, while having only moderate startup and ending lag. However, it has short reach, along with a very small sweetspot that lasts for only one frame, possesses very high landing lag, and cannot autocancel in a short hop, making it extremely difficult to sweetspot without set-ups. 13% (clean), 8% (late) A quick backhanded strike. Has low landing lag with decent range, and autocancels in a SHFF, so it is one of Captain Falcon's best approach options. It can also Ccombo into a dash attack or grab on landing at low percents, and has respectable power, KOing middleweights at around 135% from center stage when clean. 11%/10% (clean), 10%/9% (late) A flip kick. Has fast startup with a decently long duration, good all-around range (though not directly below him), low ending lag, minimal landing lag, low base knockback and autocancels in a short hop. All these attributes make it an excellent combo move. Depending on percent and positioning, it combos into itself and any other aerial. At mid to high percents, an up aerial on a grounded opponent can combo into a down aerial meteor smash, which is deadly at the ledge, or alternatively Knee Smash, usually guaranteeing a KO. It is also a decent KOing option on its own, KOing below 150% near the upper blast line, and the late hit is a weak semi-spike that is effective against opponents with poor horizontal recoveries. Captain Falcon can also land with an up aerial after hitting an opponent with Falcon Dive, as he sustains less landing lag than the RCO lag he would sustain otherwise. 14% Stomps downward. A strong meteor smash when sweetspotted at his legs, but deals high horizontal knockback nonetheless if sourspotted. It can notably lock opponents at low to mid percents. — Reaches out with a backhanded swing. Captain Falcon's grab range is short, but his dash grab has deceptively long range due to propelling him a long distance forward. 2% Knee strikes the opponent. A fairly fast pummel. 5% (hit 1), 4% (throw) Punches the enemy, sending them forward. Can be followed up with a dash attack. It can also lead into a pivoted forward tilt lock at low percents, but this only works if the opponent misses their tech. 5% (hit 1), 4% (throw) Puts the enemy behind him and kicks them backwards. Can KO at high percentages near the edge, starting at 150%. 4% (hit 1), 3% (throw) Holds the enemy up and punches them upward with his left hand. 6% Swings the foe overhead and then slams them on the ground with a single arm. Can be followed up reliably with neutral air, up air and Knee Smash. It is his only throw that consists of a single hit and is weight dependent. 7% Does a spin on the ground to kick both sides. 6% Spins around to do a double kick. 7% Gets up and kicks with his right leg. Default Falcon Punch 25% (ground), 28% (ground reverse), 22% (air), 25% (air reverse) -Winds up and releases his iconic fiery punch. Turning around while using the move increases its power, but slightly increases its startup lag, while landing an aerial punch lowers its power. Inputting a direction (up or down) when charging Falcon Punch in the air will give a slight boost in that direction, which also applies for custom variants. Custom 1 Falcon Dash Punch 20%/16%/13%/11% (ground), 22%/18%/15%/13% (ground reverse), 17%/15%/13%/11% (air), 20%/18%/16%/14% (air reverse) Captain Falcon dashes forward a fair distance forward before unleashing his Falcon Punch. Weaker than normal, especially in the later stages. Custom 2 Mighty Falcon Punch 22%/18%/9%/6% (ground), 25%/18%/6% (ground reverse), 19%/18%/6% (air), 22%/18%/6% (air reverse) Has a very large hitbox that lasts a while, but has less power and longer startup lag. Late hits do much lower knockback. Default Raptor Boost 9% (ground), 8% (air) Dashes forward, performing an uppercut on the ground if an opponent is in range, or a downswing in the air. The grounded version can KO middleweights at around 125% without rage, while the aerial version can meteor smash opponents below Captain Falcon. Custom 1 Heavy Raptor Boost 12% (ground), 12% (air) Mre startup and travels a low distance, but has more power and super armor. Custom 2 Wind-Up Raptor Boost 9% (ground), 8% (air) Moves backwards a bit before dashing forward. The charge is faster and the move has negligible endlag in the air, but the resultant animation increases its startup lag and reduces its travel distance, while the move is additionally weaker. Can be used for mindgames. Default Falcon Dive 5% (hit 1), 12% (throw) Leaps upward and grabs any opponent that comes in range, launching them away with an explosion. If successful, Captain Falcon will flip backward while shouting "YES! ", and can use the move again instead of becoming helpless. Custom 1 Falcon Strike 8% Jumps up and punches in the sky, damaging opponents above him. Travels higher than Falcon Dive and grants very high air acceleration during the move. Can be used as a combo finisher, but doesn't grab opponents and has less horizontal momentum. Custom 2 Explosive Falcon Dive 10% (hit 1), 15% (throw) Charges longer and doesn't go as high as Falcon Dive, but has much more launching power. Default Falcon Kick 13%/11%/7% (ground), 15%/13%/11% (air), 9% (landing) Bursts forward with a flaming high-speed kick. If used in the air, he will plunge down at a diagonal angle. The grounded version launches vertically and KOs middleweights at around 120% when clean, while the aerial version launches horizontally and has a landing hitbox. Custom 1 Falcon Kick Fury 1% (ground loop hits), 7% (ground last hit), 2% (air loop hits), 5% (air last hit), 5% (landing) Hits multiple times, with the last hit launching the opponent. The last hit has less knockback, however. Custom 2 Lightning Falcon Kick 12%/10%/6% (ground), 14%/12%/10% (air), 4% (landing) A faster-moving kick that is much weaker and has more startup, but goes right through opponents. Using it in midair stalls Captain Falcon when the move completes. The landing hit paralyzes opponents. Blue Falcon 10% (hit 1), 20% (hit 2), 10% (throw) Calls in the Blue Falcon, which crashes through the stage in front of him. Should it hit an opponent, a short cutscene plays where they are run over and sent flying. Characters who are not hit will stay in place until the end of the move. Like certain other Final Smashes, if no one is hit when the Blue Falcon appears, the attack fails. The Blue Falcon spins to a stop, Captain Falcon jumps out, and then the Blue Falcon speeds off. Uniquely, Captain Falcon's jumping animation will differ based on facing direction (a simple vaulting jump if facing right, and a front flip if facing left). Up taunt: Charges himself up with a fiery aura, similar to Falcon Dive's startup. Side taunt: Briefly pulls back his arm before thrusting it out and gesturing his opponent to come closer, exclaiming "Come on!". Down taunt: Gives a salute to his right side while saying "Show me your moves!" When facing left, Captain Falcon extends his saluting arm behind him; this also shortens the taunt. Leans forward and thrusts his arm out. Similar to his other idle pose, but this time crouches slightly and thrusts his elbow out. An electric guitar-based cover of the short track that would play when a character finished a race in F-Zero GX. Performs two jump kicks, then does a pose. Charges up fiery energy, similar to one of his Melee poses, but with fire added. Does three roundhouse kicks and then strikes a pose. Big D - Considered one of the best King Dedede players in the world, also has a notably strong Falcon. Eda - A strong Captain Falcon main from Japan. Placed 5th at Sumabato 22 and 9th at Karisuma 15. Has wins on ikep, Shogun and DIO. Fatality - Widely considered to be the best Falcon main in the world, with wins over CaptainZack, Larry Lurr, Salem, Cosmos, Nairo, Dabuz, komorikiri, Kameme, Marss, and ZeRo. Ranked 14th on the Panda Global SSB4 Rankings and 1st on the Georgia Smash 4 Power Rankings. Placed 2nd at 2GGC: Civil War, 2nd at Momocon 2017, and 5th at Frostbite 2018. He is the 25th player to take a set off ZeRo. Kesa - The best Captain Falcon player in California. Has wins over Elegant, K9sbruce, Sho and pu55yk1ng. Kirbis - Notably placed 7th at Little Big House 4. Marss - Uses Captain Falcon as a counter-pick for Diddy Kong and for Final Destination. Has taken sets from MVD, Light, dyr, and Pugwest. Meek - Formerly ranked 10th on the Michigan Smash 4 Power Rankings. Nanon - Considered to be one of the two best Falcon players in Mexico, along with z0mfg. Placed 9th at Smash Factor 4 and 17th at Smash Factor 5. NickC - Has wins over Dabuz, Sinji and Frozen. Ntarps - 17th at KTAR XV and Shine 2016. He has wins on players such as dyr, Remzi, Pugwest and James. Pichi - Considered the best Falcon player in Japan. Placed 1st at Umebura 24. Runes - One of the best Captain Falcon players in Michigan. Ranked 11th on the Michigan Power Rankings. Saiya - Currently ranked 49th on the JAPAN Power Rankings. Sean - Took sets off of Tsu- and Mr.E at Frame Perfect Series 2 and placed 9th. SETHsational - The best Falcon player in the Midwest. Ranked 10th on the Michigan Power Rankings. Has wins over Raito, Rags and Ryuga. Souther - Currently ranked 122nd on the JAPAN Power Rankings. Tearbear - Formerly ranked 18th on the SoCal Smash 4 Power Rankings. Has wins over Larry Lurr, VoiD, and FOW. TraX - Best C. Falcon in Luxembourg. Tsu~ - Currently ranked 82nd on the JAPAN Power Rankings. YuriAIR - Placed 49th at Umebura S.A.T. zOmfg - Currently ranked 11th on the Mexican Smash 4 Power Rankings and considered to be one of the two best Falcon players in Mexico, along with Nanon. Took sets off Wonf and Chota. Placed 7th at Smash Factor 4 and 13th at Smash Factor 5. Acid - Notably beat Fatality in Captain Falcon dittos at Tipped Off 11. Demitus - Was ranked 7th on the Chicago Smash 4 Power Rankings. He stopped playing Falcon in 2016. Glutonny - Has mostly dropped this character. GrimTurtle - Switched mains to Bayonetta and Fox. Max Ketchum - Was ranked 11th on the New Jersey Smash 4 Power Rankings, with a notable win over Nairo. He switched to Cloud/Lucina in 2016. ZeRo - He notably beat Ito with Captain Falcon at NorCal Regionals 2015. Occasionally (although rarely) breaks the character out in tournament, most notably against Tsu- at Frostbite 2017 and against Fatality at MomoCon 2017. During the early lifespan of Smash 4's metagame, Captain Falcon's buffs were immediately noticed, with the most notable of them being the heavy changes to hitstun canceling and the improved combo ability on his moves. As a result, he has always been considered a high tier character, thanks to his quick mobility, high power, and the ability to perform heavily damaging combos and juggles with his throws and aerial moves, with his combos being quite easy to start due to his far-reaching dash grab. His representation has been strong throughout the game's lifespan, both due to his own strengths and his general popularity as a character. However, perceptions surrounding Falcon have not grown as much as other higher tiered characters than him, due to his poor recovery and difficulty escaping pressure and combos, along with receiving nerfs to his damage output and KOing ability through game updates. Players also began to cite his troublesome match-up against Sheik, who would go on to become the perceived best character in the game for a long period of time. Despite this, his playerbase is among the largest in the entire roster, with players such as Acid, Fatality, Nanon, Pichi, Souther, Tearbear, ZeRo and z0mfg achieving strong enough tournament results with the character. He would rank at 14th on the first iteration of the 4BR tier list, at the very top of the mid-tier, then dropped six spots on the second tier list to 20th, and dropped once again to 23rd on the third tier list. However, the change in the arrangement of the tiers caused him to be ranked more positively than in the initial tier list. However, his tier placement became a topic of debate amongst players, due to the recent appearances of many noteworthy results. Most notably, Fatality placed 2nd at 2GGC: Civil War, which is one of the largest Smash 4 tournaments to date. Afterwards he went on to decisively eliminate ZeRo from MomoCon 2017, even while ZeRo counterpicked. This had him rise to 19th on the fourth and current tier list. Overall, Falcon has had the third highest rise from the Brawl tier list, and is one of the characters to have improved the most from that game. In the F-Zero racing scene, Captain Falcon uses his Blue Falcon to win big. His origin largely a mystery, he's made his way to the Smash Bros. battlefield to prove his worth outside the cockpit. He's got speed and power, and his distinct Falcon Punch leaves a dent. Start it in the air to surprise your foes! We love it when this F-Zero pilot from Port Town takes a break from racing the Blue Falcon to take on challengers in brawls. His balance of speed, power and weight is spot on, and his slow but mighty Falcon Punch is oh so sweet when it finally connects. Try starting the attack in mid-air and punching your way into a frantic fray! Captain Falcon's default down special, Falcon Kick, is no ordinary kick—it surges forward in a fiery blaze. It's a versatile attack that moves sideways on the ground and diagonally down in the air. His forward air attack, Knee Smash, can send an enemy flying for miles if hit just right. The captain's Falcon Kick isn't just any old kick - it blazes either to the side or diagonally down to terrorise the enemy. Its speed also makes it top-notch for surprise attacks! Another move to try out is his forward air attack, Knee Smash. If you get as close to someone as you can before using it, it can launch them miles! Captain Falcon's Final Smash lets him pull opponents into the middle of an F-Zero race-where competitors have been known to break the speed of sound-and run them over with his racing machine, the Blue Falcon. If he manages to grab you, there's no escape. The impact launches its victims diagonally upward. All-Star Battle: Secret: Captain Falcon is one of the opponents fought in this event. All opponents are characters that have been unlockable in previous Super Smash Bros. games. Bounty Hunter Clash: Captain Falcon must defeat Zero Suit Samus in a 2 stock battle. Afterwards, 2 Villagers will appear and challenge the player. Up to Speed: Captain Falcon appears as an opponent that Sonic must defeat. Full Speed Ahead: Captain Falcon and Sonic must defeat another Captain Falcon and Sonic in a high-speed stock battle. Sky Pirates: Meta Knight and Dark Pit must defeat Captain Falcon and Falco before the plane returns to the airfield. Captain Falcon's reveal in the By Book, Blade, and Crest of Flame trailer. Captain Falcon's full design in the By Book, Blade, and Crest of Flame trailer. Falcon Kick on Mega Man. About to strike Robin with Raptor Boost. Left-face down taunt in Smash Ball standby on Halberd. Blue Falcon, Captain Falcon's Final Smash, being used on Yoshi, Sheik, and King Dedede. Right-face down taunt with Palutena, as well as Captain Falcon using a Metal Box. Forward Smash on Toon Link. The lines bordering Captain Falcon's "eyes" change depending on the costume used. Of all the veterans that have appeared in and retain their voice clips from Brawl, Captain Falcon and Ganondorf are the only ones to not make use of knockback sound clips that weren't used in-game in Brawl despite having them. Captain Falcon, Yoshi, and Jigglypuff are the only characters who have voice clips that have been used in all four Super Smash Bros. installments. Super Smash Bros. for Nintendo 3DS is the only game where Ness and Captain Falcon do not have the same availability. This page was last edited on February 12, 2019, at 18:22.